The water level has been pretty low lately but I went for try anyway. The peacock bass retreated to deeper ends while the snakeheads widens their playground. I saw 4 snakeheads today; 1 toman, 1 haruan and two forest snakeheads. I hooked up one and another threw its hook at arm's reach. The toman acted really timid, it came out from its cover to check out my stickbait and dashed away. It's a pity forgot to bring my video cam with me today, somehow I knew it meant catching something interesting. Nice snakehead and stick bait, , how was the fight like ? Heard that it is ferocious when whacking its prey, is it true ? Well it was quite aggressive going after the stickbait after it missed on the first hit but fight wise I didn't feel much of it, probably because my drag was set rather high. I usually does so when I use stickbaits or poppers as they can accomodate more beefy hooks compared to crankbaits. It can be real troublesome when a fish manages to steer its way into weeds or branches in the water, and that's where they usually hide. Give me tips on snakehead i've been trying to catch it but fail to it.. Other than using lure, is't possible to use bait ? If it is, what bait ? Peace, that lure you got there looks very familar. Smiley :) wrote: Give me tips on snakehead i've been trying to catch it but fail to it.. Other than using lure, is't possible to use bait ? If it is, what bait ? I've replied to your thread regarding this, take a look. 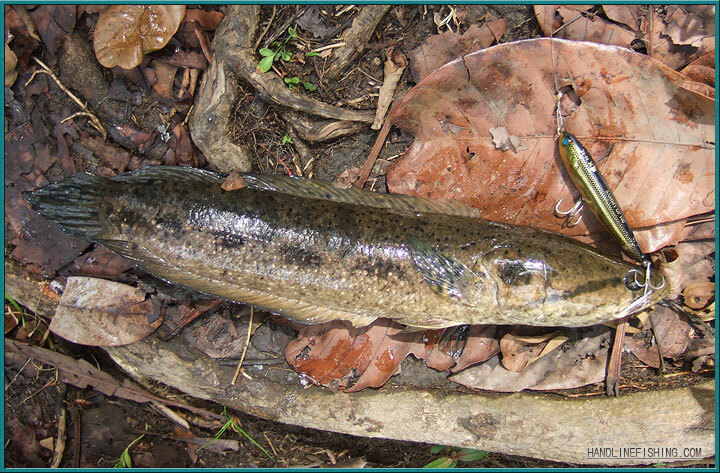 With regards to Forest snakeheads, they're quite similar to haruans except they stay very close to forest streams and seldom venture out into open reservoirs.